Click on the Black Cat for a more detailed map . 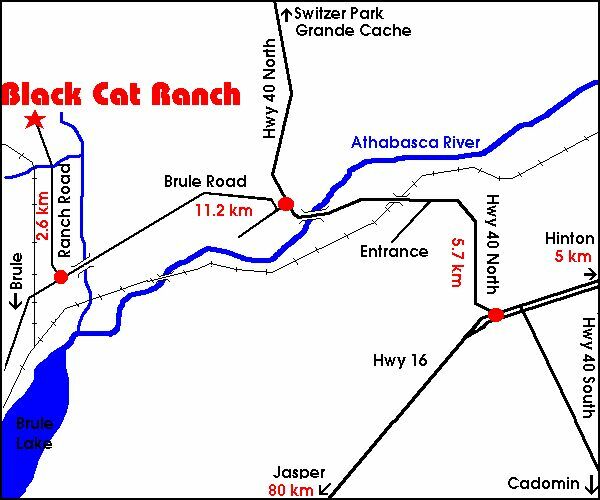 The Black Cat Guest Ranch is located on the east boundary of Jasper National Park, 20 km from Hinton. Our nearest International Airport is Edmonton. This airport is served by many major Canadian and International airlines. Most of our out-of-province guests fly into Edmonton, rent a car and drive to the ranch. Driving time from the Edmonton airport is about 4 hours. Another common route is to fly to Calgary then drive to the ranch via Banff and Jasper parks. This is a drive of over 6 hours and should be done over 2 days. The Icefield Parkway (Highway 93) from Lake Louise to Jasper is one of the most spectacular mountain highways in the world and you should allow yourself plenty of time to enjoy the scenery. If you are doing a driving tour of Alberta, please remember to allow yourself plenty of time. Alberta is a big place and there is a lot to see.